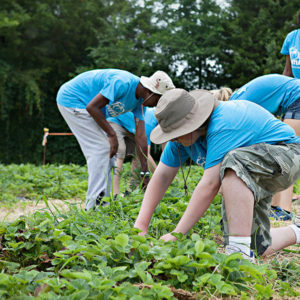 The Food Initiative is growing healthy food, empowering lives, and building community. Our Summer Youth Program (SYP) is our most intensive program. High school students from all over Clarksville/ Montgomery County and Fort Campbell are hired to work on our farm and in the community. 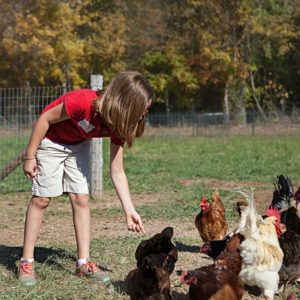 We offer fun, hands-on, educational farm field trips for Preschool through 8th grade students during the school year. Lessons follow Tennesse Academic Standards in a way that brings their curriculum to life! From corporate groups, to sports teams, to youth groups, our Cultivating Community Program offers a variety of activities that help strengthen and develop positive team dynamics. The Food Initiative is a 501(c)3 non profit organization in Montgomery County, TN. Our 12 acre farm is an instrument to bring the community together to learn and experience the food system first hand. We grow a wide variety of organically grown, seasonal produce as well as raise laying hens, goats and pigs. All of the operations on our farm are conducted in a sustainable manner. The food harvested at The Food Initiative is dispersed throughout the community in several ways: through our CSA (Community Supported Agriculture) Program, through local hunger relief organizations, and at the Clarksville Downtown Market. Sign up to receive updates on our programs, events, workshops, and more.